Industrias JAAPSA S.A. de C.V. 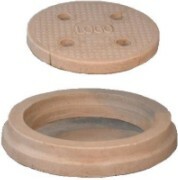 Rehabilitation Manholes® can be installed within existing concrete, brick or precast manholes to provide a long-term and cost-effective solution to manholes rehab. Industrias JAAPSA S.A. de C.V. MANHOLES/WETWELLS®, made in a single polymer piece reinforced with fiber glass, it includes steps of concrete polymeric. Measures: 1.20m of diameter. Different measures from height according to its projects. Resist the attack of hydrogen sílfide and most sever weather conditions. Variety of rank of dimensions of pipes. Cover with nonskid surface for its easy rise®. MATERIAL APPROVED BY THE FDA, NONE POLLUTING. MADE SPECIALLY FOR USE IN IDEAL HEAVY. IT REDUCES THE INNER AND OUTER FILTRATIONS. Our COVERS ®, are made with REINFORCED POLYMER which makes light and resistant to chemical attacks, with which you benefitted in a easy and fast installation. The cover with a Resistance of: 366 kg x cm2. Industrias JAAPSA S.A. de C.V. Fiberglass Wetwells® are suitable to use in storm, industrial, electric and sanitary with a temperature range of 40°F to 150°F.Their fiberglass reinforced material are virtually inert to corrosion or stay electrical currents.